The report covers a global and regional level estimation and analysis for the mulch film market. The study provides forecast from 2018 to 2024 along with a historical data from 2015 to 2017 based on volume (Kilotons) and revenue (USD Billion). The study includes major drivers and restraints for the mulch film market along with the impact they have on the demand over the forecast period. Additionally, the report includes the study of opportunities available in the mulch film market on a global level. For providing the users of this report a comprehensive view of the mulch film, we have included a product portfolio of key vendors and a detailed competitive scenario. To understand the competitive landscape in the market, an analysis of Porter’s Five Forces model for the mulch film market has also been included. The mulch market report covers an in-depth study of global and regional market and market attractiveness analysis, wherein application segments are benchmarked based on their growth rate, general attractiveness and market size. The study provides a decisive view of the mulch film market by segmenting the market based on type and application. The market is estimated from 2018 to 2024 and all the segments have been analyzed based on the future and present trends. On the basis of applications, the market has been segmented into black mulch, clear/transparent, colored mulch, polypropylene & polyethylene and degradable mulch. On the basis of applications, the market has been segmented into agricultural farms, and horticulture. The regional segmentation includes the current and forecasted demand for North America, Europe, Asia Pacific, Latin America, and the Middle East and Africa. The report also covers detailed description of key players includes parameters such as financial overview, company overview, business and recent developments of the manufacturers. 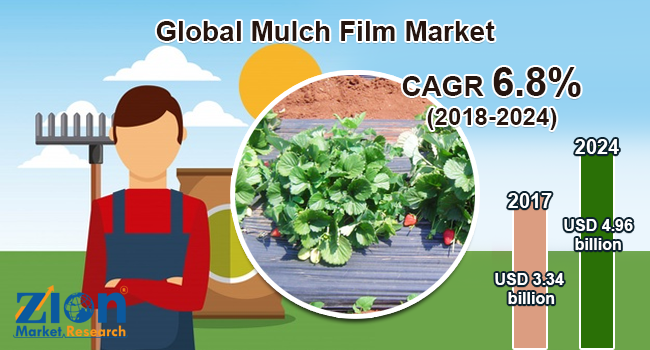 The key players in the global mulch film market are British Polythene Industries PLC, Britton Group, AEP Industries Inc., BASF SE, Armando Alvarez Group, Ab Rani Plast Oy, Kuraray Group, Plastika Kritis S.A., ExxonMobil Chemical, Group Barbier, The Dow Chemical Company.